Everyone loves their pets for the companionship and enjoyment that they give. 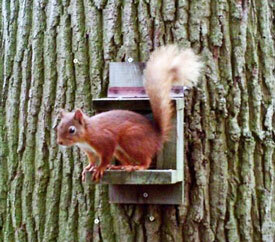 However, they can have a significant impact on red squirrel populations in urban and suburban areas. Here are a few guidelines on how to keep squirrels (and other wildlife) safe whilst still enjoying your pets. Treating your cat to a new collar, fitted with a bell. This might just give squirrels enough warning to get away. Making sure that your cat is fed well and regularly. A hungry cat is a threat to wildlife. Bringing your cat indoors at night so that he/she will not be about when squirrels are active at first light. Making sure that the squirrel feeder is out of reach of cats. A walk in the woods is great fun for dogs and owners alike. It keeps them fit and provides all the pleasures of the outdoors. However it is important to remember that you are sharing the area with the animals that live there all of the time. Please don’t allow your dog to chase squirrels even though it may seem harmless. 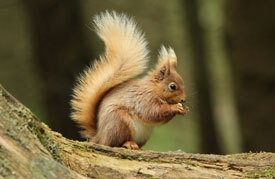 Squirrels spend a great deal of time and effort foraging for food. Being chased wastes energy that has to be made up, which is especially hard to do in the winter months. It also causes stress, which may have a bad effect on their ability to breed. Extra attention must be paid during breeding months as females under threat may be forced to abandon their dreys and move their kittens elsewhere putting them under unnecessary stress. 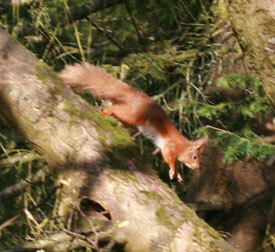 At this time it is best to keep dogs on a short lead while in a squirrel populated area.